Launch an app in a snap. 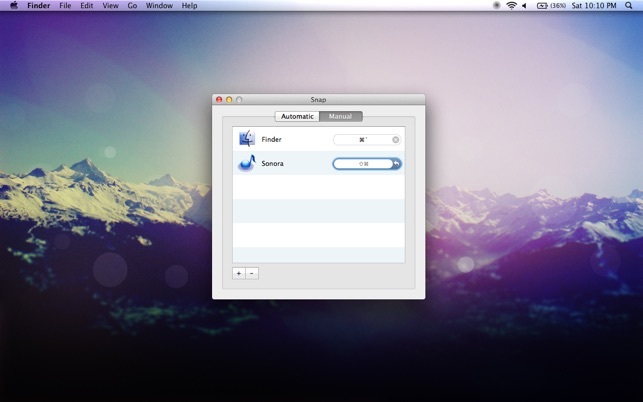 Ridiculously easy shortcut management for the Mac. Lifehacker's Download of the Day, June 15, 2011. Snap automatically assigns keyboard shortcuts to apps pinned in your dock using a modifier key (command, option, control, or shift) and the number keys. For example, command+1 opens the 1st app in your dock, command+2 the 2nd, etc. Rearrange or add new apps to the dock and the shortcuts will automatically reset. Set a custom shortcut for any app on your Mac. Open apps faster than you can say "Launchpad". Press a shortcut once to reveal an app window, and again if you want to hide it, allowing you to quickly glance at running apps. When I switched from Windows several years ago the only thing I missed was easy creation of shortcuts. Now I can do the same on Mac, thanks to SNAP! It works great on Mountain Lion. Loads at start. Custom shorcuts as well as dock shortcuts work as described. Love it, thank you! 1) Would be nice to open several windows with just one shortcut. Example, I usually open following aps on start - Safari, Firefox, Mail, Notes, Skype… wonder it it's possible to create just one shortcut so all asigned windows open at once. 2) Not sure if it's system limitation or not, but Finder is always number 1 in dock, however, pressing Command + 1 opens app that folows Finder in dock, in my case Finder - 1, Safari -2, Mail - 3, etc. Presing Command + 1 opend Safari, not Finder. Snappy! It works like a charm, I love how you have both automatic and manual modes - automatic is for all dock apps, and manual is for any app you want to have a shortcut - but my only suggestion is to have the option to remove the bezel that appears every time you open an app with snap. It's not that bad, but it slows down the transition between apps. I know some people like it, but at least the option to remove it would be nice. This application works as described and is very quick. I love the ability to make your own shortcuts! 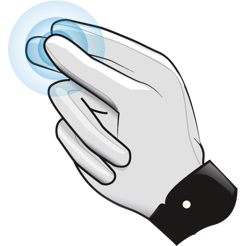 Like other new users though It would be intreguing to actually see some legitimate finger snapping in the app considering the application name and icon.